Located in the heart of Spokane Valley, Washington the “NEW” Yoke’s Sprague location is just 1.1 miles from Yoke’s original Spokane Valley store erected in 1985 at the corner of Sprague and Sullivan Avenue. This new addition to the Yoke’s family of stores is proud to return and be a part of the Spokane Valley Community. 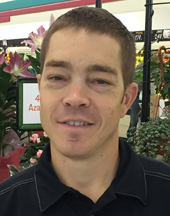 Chad Moses is excited to be the Store Manager at the new Yoke’s Fresh Market on Sprague. He has spent his entire working life in the grocery industry. He started his career in the small town of Omak, Washington and has worked for Yoke’s for 20 years. When Chad is not working, he enjoys spending time with his two boys, and has been involved in coaching youth baseball for over 10 years. He also enjoys spending time at the lake camping and fishing.